The wide-ranging impact of the FBI investigation that's brought college basketball to its knees also promises to alter the sport in major ways in both the short and long-term. The college hoops world is already reeling from the immediate blast of the bombshell, but the fallout is far from over. The tenor of the 2017-18 season has completely changed, and the landscape of the sport just had its soil uprooted and exposed for all to see. 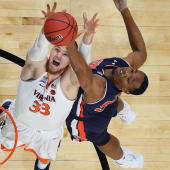 "The dark underbelly of college basketball," as U.S. Attorney Joon Kim described it at a Tuesday afternoon press conference in New York City is the ugly new reality. Fraud, bribery, corruption. Incentives ranging from $13,000 and into the six figures. It's some of the worst college sports has to offer. The FBI and the NCAA have a lot of work to do. That work will be the backdrop on the season to come. Bear in mind this grenade went off three days prior to the sport opening for official practices. (The season is just over 40 days away, its start date Nov. 10.) And as it stands right now, a lot of men -- and plenty of players -- who were planning on being a part of the 2017-18 college hoops season will no longer be. Their chances of ever partaking in a college season again are slim at best. Start with the coaches. Arizona's Emanuel Richardson, USC's Tony Bland, Oklahoma State's Lamont Evans and Auburn's Chuck Person have all been suspended. Soon, they'll all be fired, probably never to coach in Division I again. But before they go, who will they take down with them? It's key to keep in mind that more coaches are under suspicion. It's key to keep in mind just how much leverage the FBI and the Department of Justice will have when it comes to leaning on defendants. These coaches and financial advisers and shoe company reps are not drug mules protecting big bosses in a cartel. They're family men who work at proud universities, men working a corporate basketball ladder who got caught up in a money game while trying to lure the best players in an effort to eventually land themselves head coaching jobs. If pressured, they'll likely have little reason not to talk in an effort to reduce their own punishments. As for the teams, and the players, college basketball's preseason top 25 stands to get a makeover. Arizona is the preseason No. 1 team here at CBS Sports. But how many players on that roster are subject to investigation? How many players could be held out or ruled ineligible? In a flash, Sean Miller's program has gone from preseason title favorite to an alleged cheating machine. The school has already canceled its media day scheduled for Wednesday. Louisville player Brian Bowen is the most notable player in question, though he is not specifically named in the U.S. Attorney's complaint. (Connecting the dots, it is all too clear he is the player in question at the heart of the FBI's investigation into Louisville's men's basketball program.) If proven true -- and given the evidence the FBI has provided, we can work under the assumption it is true -- Bowen won't be eligible. He and plenty of others. Like Arizona, Louisville was set up as a top-10 team. USC, too. But the Trojans appear to have at least two players on their roster whose families were given thousands of dollars. Auburn, set to make a push for its first NCAA Tournament in 15 years, now may wind up having to fire its athletic director and head coach Bruce Pearl, who already has one show-cause on his resumé. Even the University of Miami, a projected top-four ACC team and likely to be ranked in the preseason polls, is mentioned in the federal case files released Tuesday. In Louisville and Miami, two of the top current programs in the ACC are under current investigation by the FBI. Incredible, and unprecedented. From an on-the-floor standpoint, there's so much to sort out. We can discuss the legal ramifications plenty, but fans also care, more than just about anything, what and who gets affected in regard to on-court product. There are eligibility concerns both public and private, as it's pragmatic to wonder if other programs, other coaches, other players will wind up being exposed in the days and weeks to come. All of this has set up the most dramatic preseason -- perhaps ever -- college hoops has ever seen. The FBI does not play. It has done what the NCAA could never even dream of. Undercover operatives. Wire-tapping. Years-long probes and mountain ranges of evidence. This is already an open-and-shut case, and as one federal official put it on Tuesday, and I'm paraphrasing: We're only sharing with the public a portion of the evidence we've uncovered. There are still coaches out there, and the guilty ones know who they are, who are vulnerable to being accused. And what are Brad Underwood and Frank Martin thinking right about now? Both employed Lamont Evans. Mike Boynton is only months into his job at Oklahoma State. Who is safe? There is a lot to figure out. "We have your playbook," New York FBI Assistant Director in Charge William Sweeney said Tuesday in a warning to other coaches. "Our investigation is ongoing. We are conducting additional interviews as we speak." In the coming days and weeks, more information will come up. College basketball's biggest story of the offseason is also its most destructive in decades. It plays like a movie, only those connected to the sport knew this was all too real. For us on the media side, the challenge was, and always will be, the burden of proof. For the FBI, which has the resources, manpower and willpower of an empire, it was another successful sting. Something accomplishable. "If we take care of everybody, we control everything, you can make millions off one kid," Christian Dawkins, a disgraced former NBA agent was caught saying in a wiretapped conversation. He also is on tape proclaiming, "If you're going to fund those kind of guys, I mean we'd be running college basketball." Bland, who was the associate head coach at USC, got caught saying, "I can definitely mold the players and put them in the lap of you guys." Instead, Bland and others put this in the lap of the FBI, who came into the case after a crooked financial adviser offered up information and agreed to be a party to the scheme. Within two years, the FBI built its case and swept the rug from underneath the sport. Even the NCAA didn't know this was happening until the FBI gave word on Tuesday morning. The NCAA's enforcement unit, and its committee on infractions, can't help but look at itself in comparison to the FBI and realize it's playing with butter knives by comparison. But still, the NCAA has a job to do and it just got urgent. The NCAA should not wait for the FBI and DOJ cases to run their course. Their side has no defined ending. For the NCAA, eligibility cases need to play out in real time, with an acknowledgement of the rule-breaking that went on. It would be a farce if players at USC, Louisville and other places earned playing time as the NCAA waited on the FBI to do the hard work first. "The nature of the charges brought by the federal government are deeply disturbing. We have no tolerance whatsoever for this alleged behavior. Coaches hold a unique position of trust with student-athletes and their families and these bribery allegations, if true, suggest an extraordinary and despicable breach of that trust. We learned of these charges this morning and of course will support the ongoing criminal federal investigation." Assistant coaches accepting cash to funnel players to universities with shoe-company affiliations. That's been the game for decades now, and it's been exposed by the federal government. But the NCAA's enforcement staff, which has known about this but unsuccessfully tried to nail violators for ages, has to get going now. Sept. 26, 2017, is a day that will go down in infamy for this sport. Perhaps it's ultimately a day that winds up changing the fundamental way players are recruited, but even those who aren't cynical have a right to want to check back in a decade from now and see how that all panned out. "We hope that these charges and arrests all help keep the sport they love clean and honest," Kim said Tuesday. In the short-term, the FBI probably did that. But it also altered the season ahead and changed the dynamics of college basketball, while revealing some of the sport's nastiest stains and smears, for the foreseeable future. The NCAA is now on the clock to act as effectively and quickly as it can. College basketball's never had so much hanging in the balance nor so much attention paid to it at this time of year.